Drive Nitro Elite Carbon Fiber rollators feature luxury design and a lightweight carbon fiber frame that weighs only 12 pounds. You can earn 649 Ocelco Cash Reward Points on this product! Drive Nitro Elite Carbon Fiber rollators feature luxury design and a lightweight carbon fiber frame that weighs only 12 pounds. Your rollator will give you the support you need without being a bulky addition to your daily life. A conspicuous brake cable is built inside the frame so you won't have messy wires hanging out to trip on or get caught. 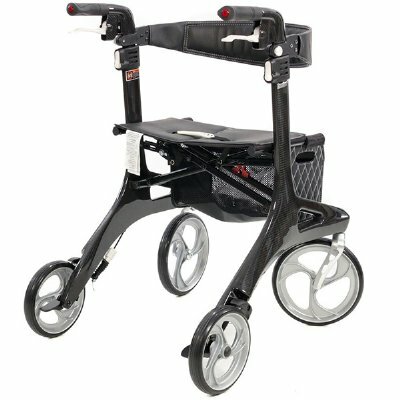 This convenient rollator glides on large 10" front casters that can be easily steered and controlled, along with a new caster fork design that allows for additional turning radius control. You will also be able to take advantage of a plush seat, removable storage bag that can stay in place even when your rollator is folded up, and handles that can be easily adjusted with the simple touch of a button. When you're not using you Nitro Elite Carbon Fiber Rollator, a stable cross-brace allows you to easily fold it up and store it out of the way. 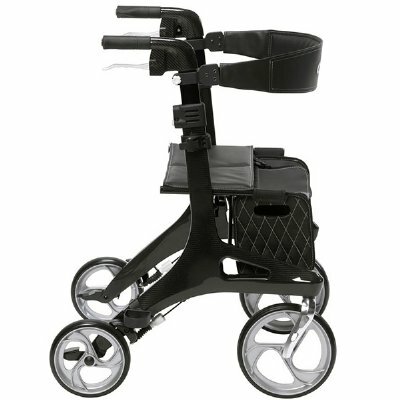 Made from extraordinarily strong and elegant carbon fiber material, the Nitro Elite Carbon Fiber Rollator features an unrivaled sleek design. Meticulously engineered and handcrafted with the finest materials and uncompromising attention to detail, this luxury rollator provides an elegance to complement any lifestyle. From sophisticated lever-activated brakes to effortless one-hand fold-ability, the Nitro Elite Carbon Fiber Rollator delivers powerful control for effortless mobility. Dream it. Live it. Own it. Life is all about experiences. Create your own with the Nitro Elite Carbon Fiber Rollator. You'll understand the unprecedented quality, craftsmanship, and pride that have gone into creating this masterpiece. When it comes to performance and durability, carbon fiber is impressive. Known for its dynamic strength and unmatched elegance, it is often used in luxury jets and sports cars. 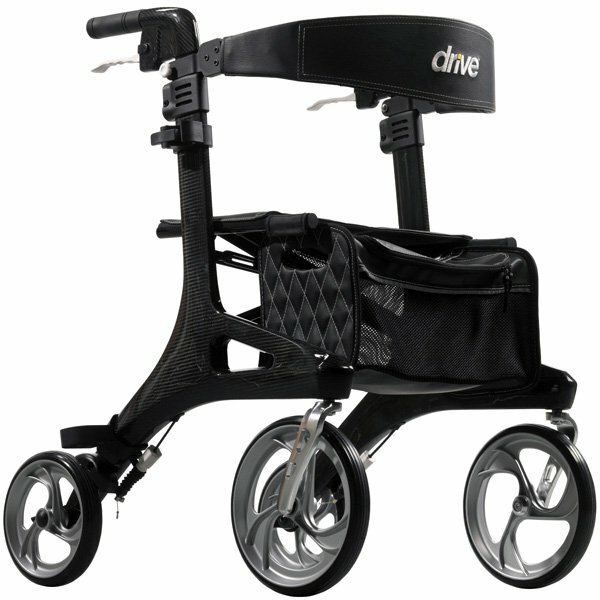 This Nitro Elite Carbon Fiber Luxury Rollator has the beauty and endurance to whisk you away on any adventure. Go push the boundaries. Your future awaits. With exquisite hand craftsmanship, this comfortable cushioned seat and easy-to-grip, adjustable handles will allow you to take in all that life has to offer. 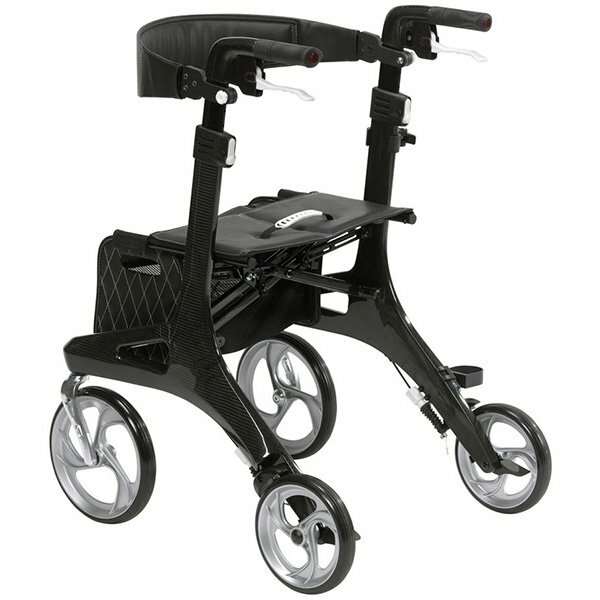 The Nitro Elite Carbon Fiber Luxury Rollator folds with an effortless one-hand control, making is easy to travel or store until your next journey. The flawlessly detailed bag attaches to the rollator. Sophisticated lever-activated brakes make it easy to control your own destiny. Handle Height: 33.25" - 38"